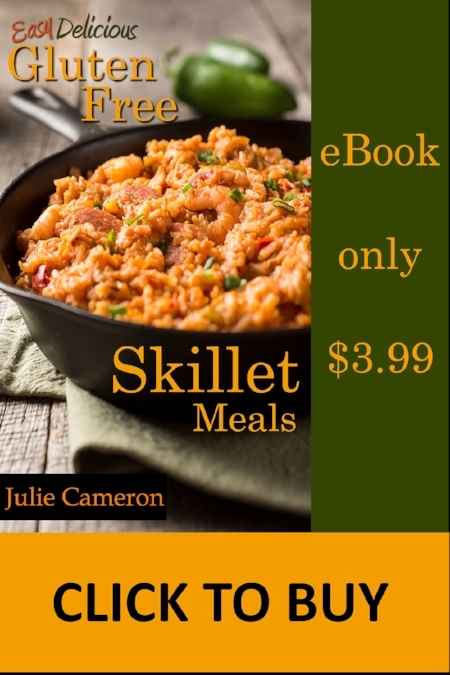 This recipe is also from our Easy Delicious Gluten-Free Skillet Meals cookbook and makes use of convenient boneless, skinless chicken breasts, frozen broccoli, and converted (parboiled) rice. Converted rice doesn’t get mushy during cooking which makes this recipe nearly foolproof. This flavorful “casserole in a skillet” is not only great tasting it’s also a healthier alternative to those calorie-laden cream soup casseroles your mother used to make. If you’ve never used converted (parboiled) rice before you will love how it holds up even when overcooked. We recommend Uncle Ben’s “Original” (unflavored) converted rice. For a less expensive alternative try Walmart’s “Great Value” store brand “parboiled rice” in bags.